This shelf is designed for EuroCave Performance and Comfort Series Wine Cellars. EuroCave, makers of the world's finest wine cellars, have introduced another breakthrough in wine storage, Main Du Sommelier shelving. A must-have for every EuroCave owner, Main du Sommelier ("Hand of the Sommelier") shelving features 12 adjustable "hands" that cradle your bottles individually and securely, just as a restaurant sommelier would. Each individual hand is a slightly concave bottle-holder lined with rubber insets to prevent bottles from rolling, rattling, or clinking together when sliding the shelf (in or out). *Note: The average maximum capacity for the MDS shelf is 12 standard-size 750mL Bordeaux bottles. Storing larger bottles, such as Pinot Noir and Rhone, may decrease shelf capacity. Not compatible with the Built In 59 Series Units. Will these shelves fit the Artevino II refrigerators, which are made by EuroCave? Would these shelves fit in an artevino III by eurocave? BEST ANSWER: I replaced all the shelves in my Artevino with these Eurocave shelves. No problem to install. They fit exactly as they do in my Eurocave Premiere. Will this fit the EuroCave Classic 266 Vielletheque I bought from Wine Enthusiast a few years back? If not, what shelves will fit? BEST ANSWER: EuroCave Main du Sommelier Rolling Shelves (Performance & Comfort Series) is designed for EuroCave Performance and Comfort Series Wine Cellars. Does this fit the vieiltheque classic 266 I bought a few years ago from wine Enthusiast? If not what shelves do? BEST ANSWER: Thank you for your question. These shelves will fit the unit you own. Please call us at 1-800-377-3330 with further questions. Yes, these shelves are compatible. Will these fit the V-144 Eurocave Classic mfg 1996? I'd like to add more shelves to my unit. If the exterior width of your existing V-144 is 26" then yes they should fit. You can also confirm with our Eurocave Technical department @ 1-800-648-6058 option. It's 19" wide and 16" deep inside. Sounds like you will need the compact ones. Is there any way to keep the shelves from rolling off the back of the track? They seem to not perform as designed, several of my shelves roll off the back of the track even when I put the shelf back very gently. BEST ANSWER: There are 4 adjustment screws in each corner to widened the shelf. This will take care of the issue that you are experiencing. This can also be found in the manual under the layout-storage section. Hello, can I fit these into my GE Monogram wine cooler? And what are the measurements please. BEST ANSWER: Hi , the EuroCave Main du Sommelier Rolling Shelves (Performance & Comfort Series) are designed specifically for EuroCave Performance and Comfort Series Wine Cellars. The Eurocave shelf dimensions are : W 21 1/8" x D 21 ¼" x H 1 1/8"
Does this shelf come with the rails to roll the shelf on? Will it fit the model V-264. Also, does the universal key fit the lock on the model V-264? Are these comparable with the Revelation L? Shelves are for the traditional Bordeaux bottles. Work well so long as your do not plan on storing any of the slightly larger format 750ml bottles becoming popular with US wineries especially for their top offerings. The new shelves tend to come off the track at the back unless you are very very careful pulling them in and our. I think they are not quite wide enough to fit the refrigerator. The rolling shelves for my Eurocave Comfort cellar are easy to install and adjust. Perfect for any bottle size or type. Unless you are storing half bottles, you cannot get 12 bottles per shelf. Most I have been able to fit per shelf is 9-10. Works as advertised and expected. Fits my eurocave V283 & V83 perfectly. Easy to assemble and install. The adjustability makes the fit of varying bottle shapes in your cellar much less daunting a task. These shelves work better than the old flat metal versions in my older eurocaves. The hands hold the bottles securely and prevent rattling as you open and close the shelves. The open design should allow for better air flow and perhaps more even temps. They handle the odd size bottles as well or better than the old shelves. Nice improvement and pretty clever design. I LOVE the rolling shelves. I originally ordered my refrigerator in the standard setup of 10 rolling shelves and one high capacity adjustible shelf and the bottom rack for oversized bottles. After having it for several months I decided I didn't like the large (up to 57 bottles) capacity shelf. I don't typically buy a case or two of the same wine. If you put an assortment of bottles on these shelves you may have to remove 6 or more bottles in stacked rows to get the ones you want out. Not fun. I ended up buying a set of three rolling shelves and removed the fixed shelf. This does drop the capacity by up to 20 bottles. If you buy a couple of cases of the same wine the shelf is a great space saver. Regarding space on the rolling shelves, each can hold up to 12 standard 750 ml bottles. Most of my wines are in tall Bordeaux style bottles (thinner body, higher neck) - I can usually fit only 10 on a shelf. If you have Pinot Noir bottles (wider at bottom, long thin neck) to mix inbetween you can probably get 12 bottles on a shelf. Plan on 10 and you won't be disappointed with capacity if you get more. If you're not sure of the type of bottles you have click on "Product Specifications" and scroll to the bottom - there's a handy guide there. Note 'Standard Bordeaux' is many varietals...Zinfandel, Etc. although my capacity is reduced the easy access outweighs the capacity loss. I've had a Eurocave comfort cellar for about 5 years. When I ordered I also added rolling shelves for all but three sections. The Sommelier Rolling Shelves are adjustable for the bottle size and different from the original rolling shelves I have. I like the adjustment as not all bottles are the same size, and with the older shelves large diameter bottles don't fit well. With the new Sommelier Rolling Shelves I can adjust the spacing for those large bottles. The one con which I view as significant is that the wood trim is now a very light varnished beech wood, which is almost blond. My original shelves came with raw sapele which is a warm brown tone. The three light wood handles really stand out. I am making three new handles out of sapele. I'm a very experience woodworker with a full commercial shop and I have about 3 hours into that project so far. Perfect!! Easy to adjust; Wine collection growing faster than I can ever hope to drink it!! Shelves make it easy to see as well as access. Exact same shelves as those that came with the unit - they look great and work wonderfully. Very easy to install too. Installation was very easy, no tools required, fit was excellent. I did notice the last heavy shelf is fixed and does not slide making it not very useful in the future. I may remove the 3rd shelf to make room for the heavy shelf. One may only need 2 extra shelves and leave the heavy one in, but they are only sold in 3. Works as advertised, very easy to install. I should have done this a long time ago when I ordered my EuroCave. Deno advised me, and made the purchase simple. I am so pleased with this unit that I helped my son get a similar one. We both enjoy a great wine, and the EuroCave is the perfect storage solution. I had some large format bottles (five and six liters) and they fit into this unit. Temperature and moisture are controlled perfectly. I could not be more pleased. Thank you, Deno! These shelves are really solid. Granted, I don't use any of the other styles, but these are perfect for storing wine in the eurocave. Have purchased several different wine cellars over 25 years, Eurocave are simply the best - great engineering & design. Very easy to install shelves. Individual cradles for holding bottles are high quality, adjustable, fits any bottle size. Quality throughout. Would recommend to anyone - worth the extra compared to any other brand! I have had 3 Euro caves over the years and recently purchased another to replace the first one I bought. The first one was about 15 years old. Although it functioned there were problems with some of the shelves not working properly. I got rid of that one when I moved and purchased a new one. The shelf problem has been fixed and I am very happy with it. I recommend it highly. 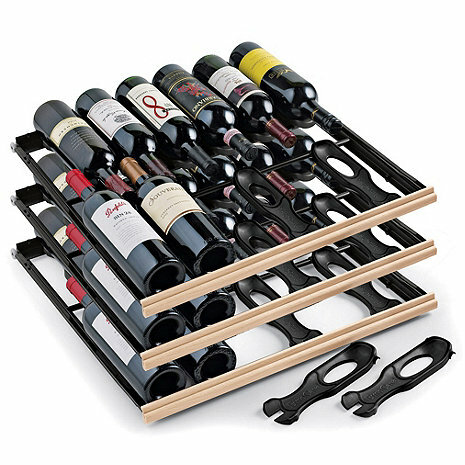 The extra racks are easy to install and provide better wine storage. Well worth it. great service after the sale. i needed additional shelves and they made sure they would fit my unit prior to shipping. Solid, good quality smooth moving shelves work great with my EuroCave Performance fridge. Would recommend better packaging when shipping, everything was moving around loosly in the box. I was told these would fit my EuroCave classic, but the mounts are completely different. I made it work, but the information is incorrect. If my Eurocave came with these, I wouldn't return the whole thing. 1) The color doesn't match the old ones. The new ones look like bargain bin white pine - like something you'd pick up at Target. The old ones are much darker and look much better. 3) The sliding bottle carriers make for an open shelf. I haven't had it happen yet, but I can certainly envision having a bottle fall through the open shelf due to my butterfingers. 4) I had to manually adjust the width of the rollers on all six shelves I received in order to get them to roll as smoothly as the ones my Eurocave came with. That's something I'd expect from $10 Target units, not ones that cost over $70 each. The "hand of the sommelier" cradles work well. On the older style rolling shelves, the bottles could have a tendency to roll around or have difficult sitting just right to get the maximum number of bottles on the shelf. The plastic cradles solve this problem. Overrall a decent product, and if you have several older style shelves anyway, no problems.